Inspired by the many bas relief roundelsI saw in Florence Italy, I chose Raphael the Archangel as the perfect subject. Raphael the Archangel is commonly referred to in the Christian tradition as the Angel that performs all manners of healing. Describing his role as written in the story of Tobias (book of Tobit), he protected Tobit on his journey while concealing his identity. He later reveals himself to Tobit and heals Tobit's father, Tobias from blindness. Raphael has become the patron of travelers, the blind, happy meetings, nurses, physicians, medical workers, and matchmakers. In recent years Raphael has become depicted more as what we commonly refer to as "The Guardian Angel." In my version of Raphael, he holds an orb with beams of light emanating from within. I focused on detailing his powerful arms and chest and the weightiness of his wings. The wings are modeled on those of the famed Condor, whose wingspans can reach an astounding ten feet! 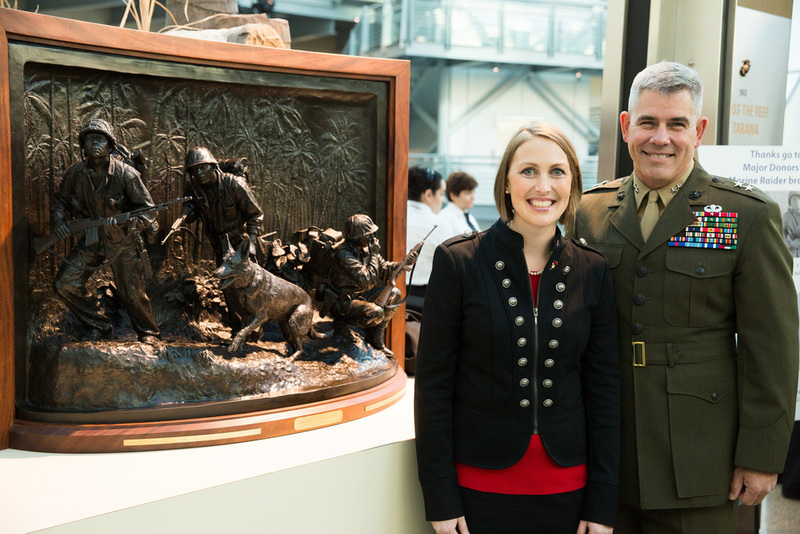 While in Washington D.C. in April, I had the opportunity to meet with Director of the National Museum of the Marine Corps Lin Ezell and learn that my bronze sculpture had been moved out of the museum. 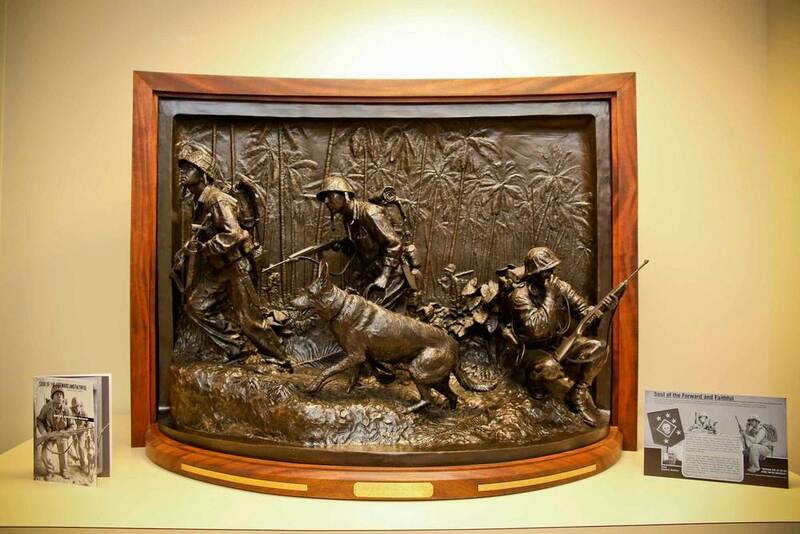 'Soul of the Forward and Faithful,' a bronze sculpture that embodies the legacy of the WWII U.S. Marine Raiders was entrusted to the collection by the U.S. Marine Raider Foundation/Association in November of 2014. The museum has been undergoing a large expansion and spent several months this year closed to the public. 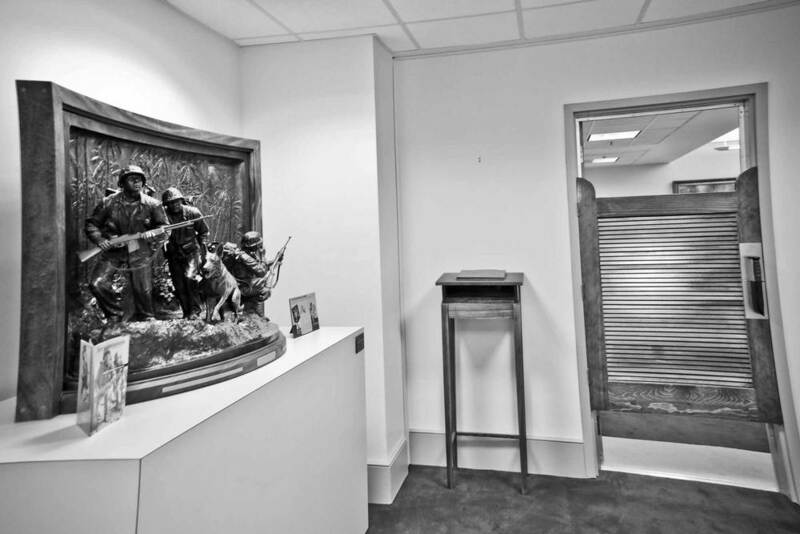 Rather than have the sculpture go into storage, director Ezell arranged for the sculpture to be moved to a prominent location in General Robert Neller's office (USMC Headquarters) at the Pentagon. 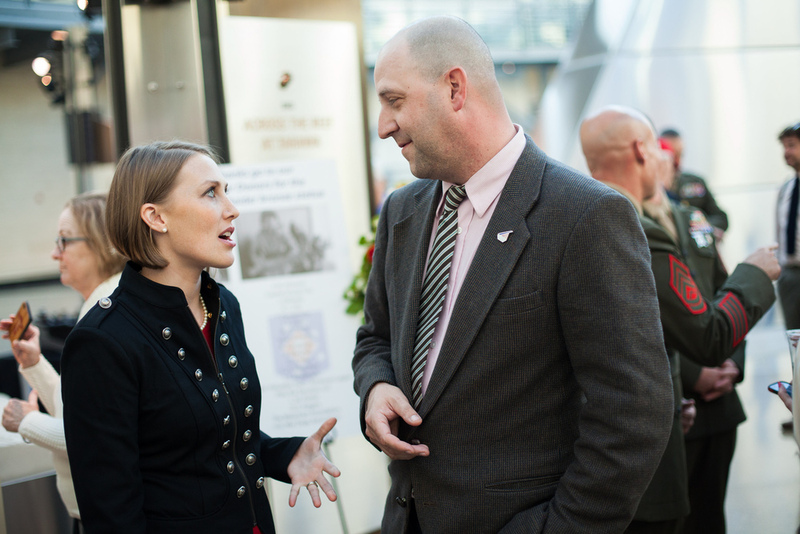 This allows many prominent officials to be inspired by the Raider Legacy through art. 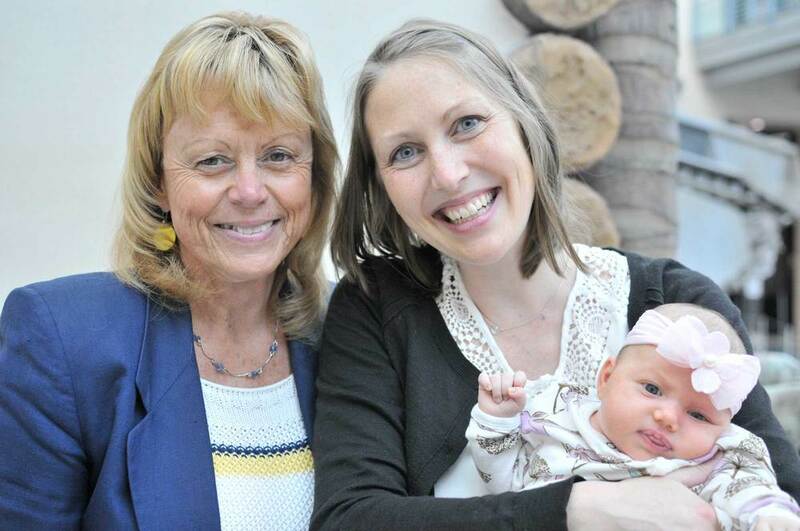 My five-week-old baby, Desiree, traveled with me to Washington DC where I received the Colonel John W. Thomason Jr. Award from the Marine Corps Heritage Foundation on April twenty-third, 2016. She traveled well and got to meet director Lin Ezell, and see the sculptures previous home in the atrium of the Leatherneck Gallery. Been to a ballet or symphony lately? Maybe you caught a movie with some friends or saw your favorite band play downtown. Chances are you were fixated on enjoying the art and were amazed at how they accomplished such a thing. No matter how effortless it seems, there is always a 'behind the scenes' where you find harried staff, exhausted writers, or weary performers. Good bronze sculpture can be no different. Lets dig through the 'to file' pile of reference material for 'Soul of the Forward and Faithful' and take a look at some of the titles that helped the WWII Memorial come to life. The 'to file' pile for the WWII US Marine Raider Memorial stands as a tower of research covering topics from historic weaponry to dog anatomy. The northeast has some of the oldest sculpture in the United States. This book catalogs some wonderful memorials of New York over the last three centuries. An excellent book on early 20th century Army clothing and gear. WWII Marines used much of the same equipment, some of it circa World War I. Another beautifully pictorial book on war memorials - this one represents sculptures nationwide. 'Grunt Gear' is a well-presented catalog of nearly all equipment used by the Marine Corps in WWII. This compelling book chronicles the amazing story of the Navajo and their unbreakable 'code', their native language. One can never have enough books on equipment if every detail must be correct or, at the least, defensible. As the subtitle states, this amazing book breaks down nearly every facet of the Marine Raiders of WWII, and contains many gripping period photographs. The dog of choice in the K-9 units of WWII was the German Shepherd. Studying their temperament is important to fully capture them in sculpture. 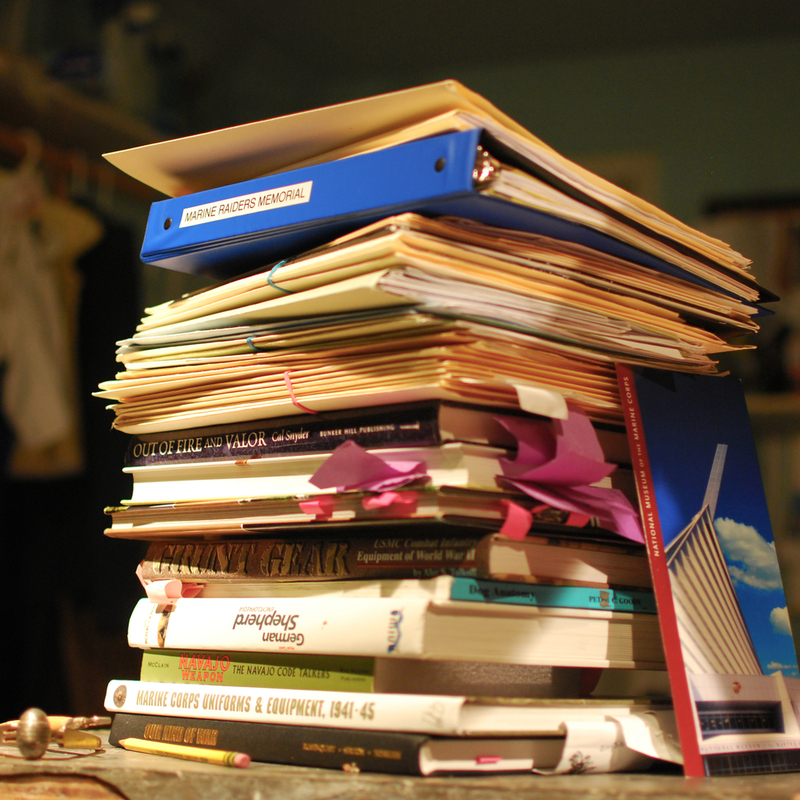 Files, Files, and more Files! Have a sudden thought at midnight or found a shred of research that must be saved? Put it in a file. You'll thank yourself later. 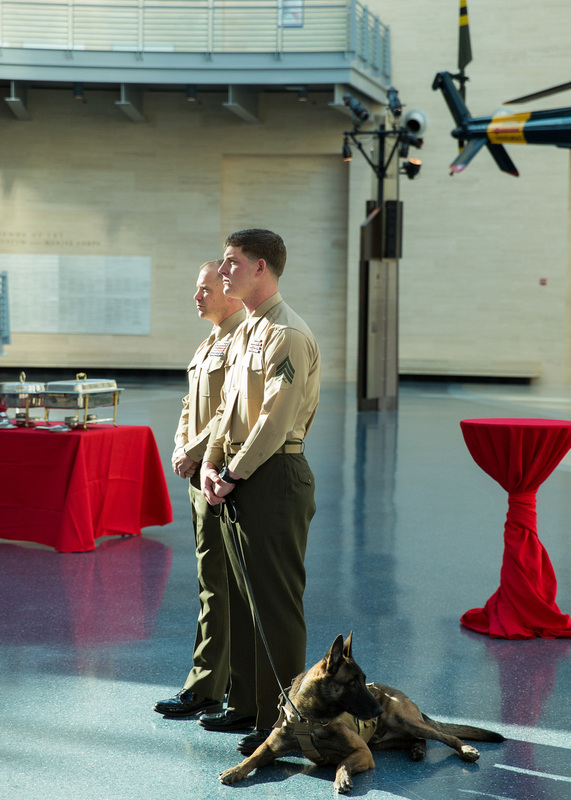 Bright and blustery was the day on which Mardie Rees’ sculpture Soul of the Forward and Faithful was formally and ceremoniously entrusted to the National Museum of the Marine Corps in Quantico, Va. 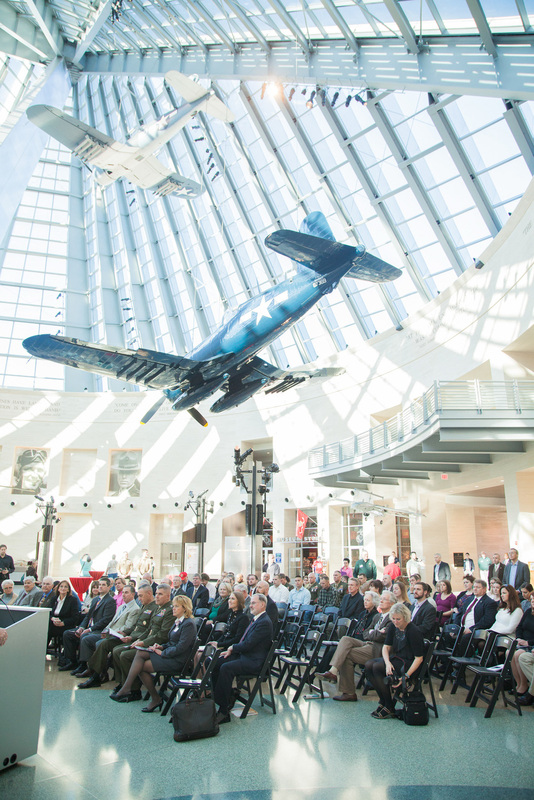 The sparkling sunlight warmed the travertine walls of the rotunda as attendees filtered through the broad entrance way of the distinguished museum. 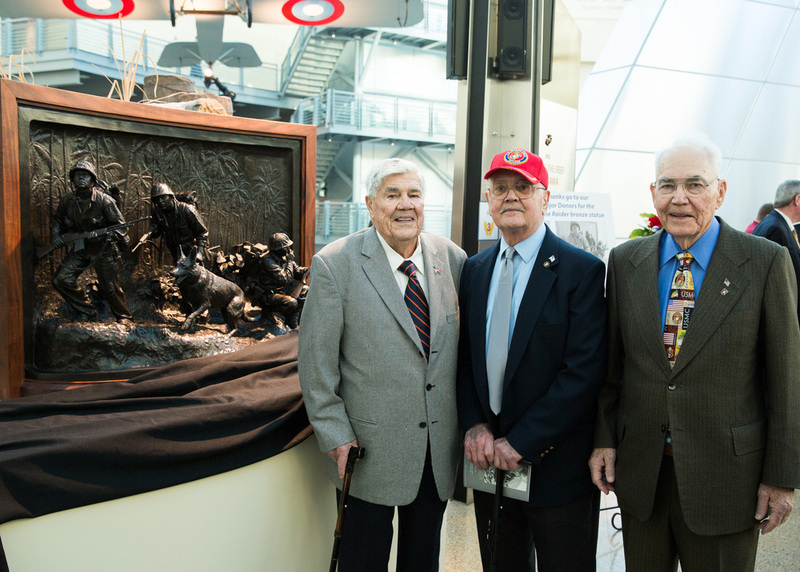 The journey for the memorial bronze sculpture had been long, having had visits to the Tacoma Art Museum in Washington, the 2014 U.S. Marine Raider Reunion, and the San Diego Air and Space Museum before travelling cross-country for its official induction at the NMMC. The charismatic Col. Giles Kyser (ret.) emceed the event, keeping the air light but reverent as he called for the posting of the colors and led guests in the singing of the national anthem. 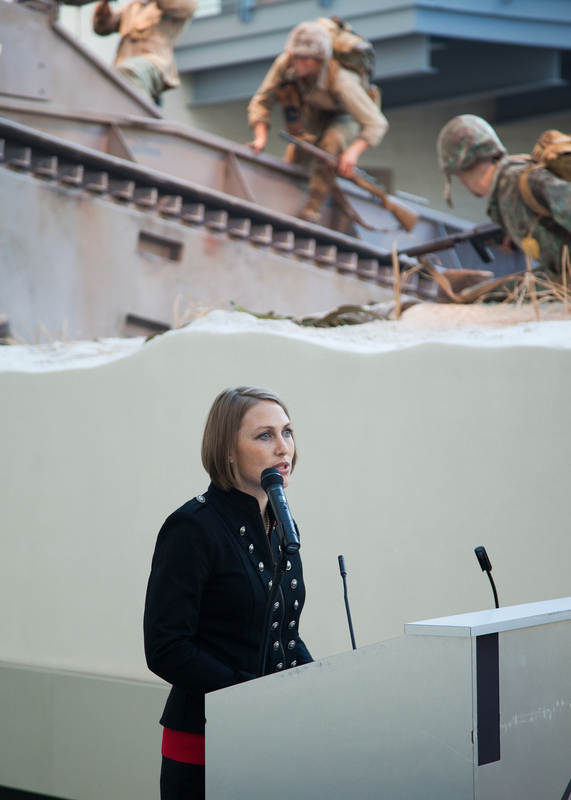 Museum director Lin Ezell was the first to address the crowd. 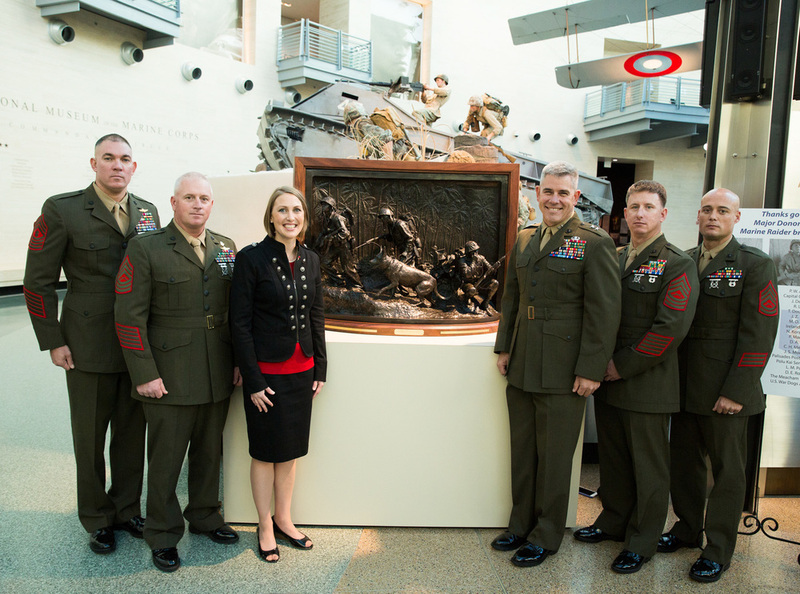 She spoke of the museum’s plans for future expansion and its eventual doubling in size, and made clear that Rees’ memorial to the marines of WWII, generously donated by the U.S. Marine Raider Foundation, would be cared for in perpetuity as a permanent part of the exhibits in the collection of the National Museum of the Marine Corps. 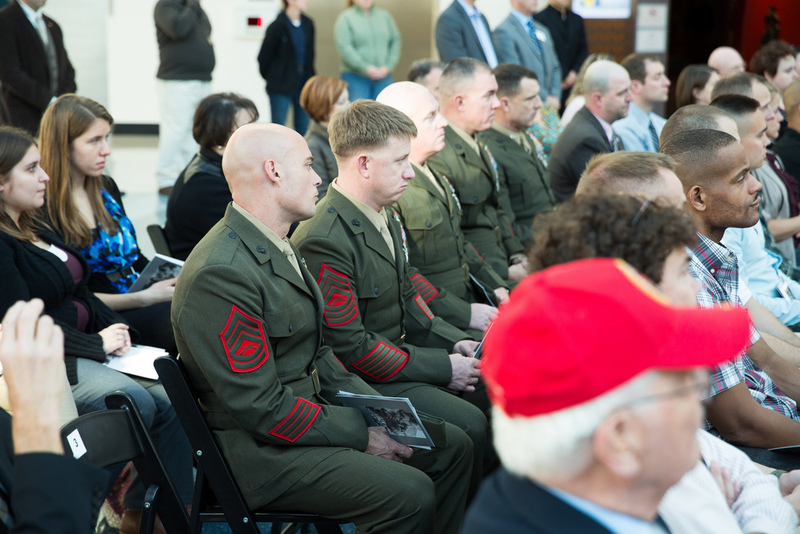 Keynote speaker Maj. Gen. Joseph Osterman then stepped up and explained the role of today’s marines, and how a proclamation by Commandant James Amos this past summer made only more poignant the connection to the original WWII Raiders and their legacy that resounds in heart of the Corps. Sculptor Mardie Rees then delivered a rousing and inspiring speech highlighting her vision in completing the sculpture. 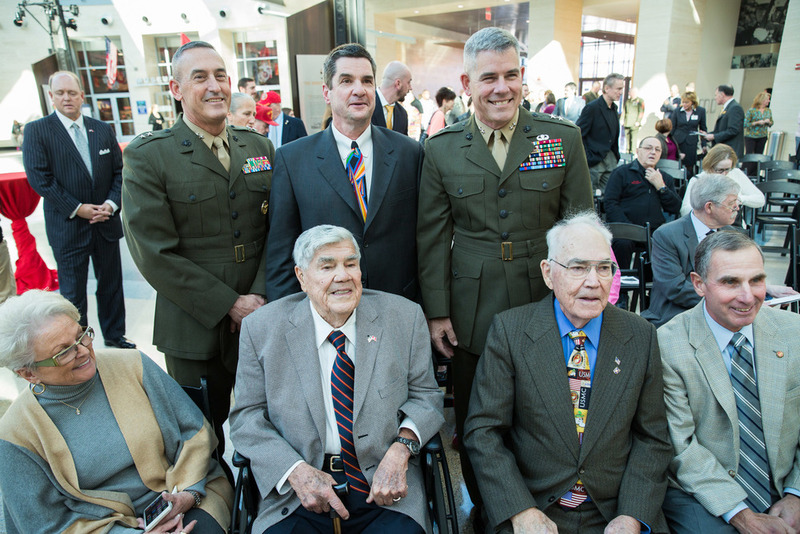 She spoke of those that she met during the project, WWII veterans who shared stories, collectors who assisted in the accuracy of the gear depicted in the piece, and countless marines, some highly decorated, and all honorable and respectable men. 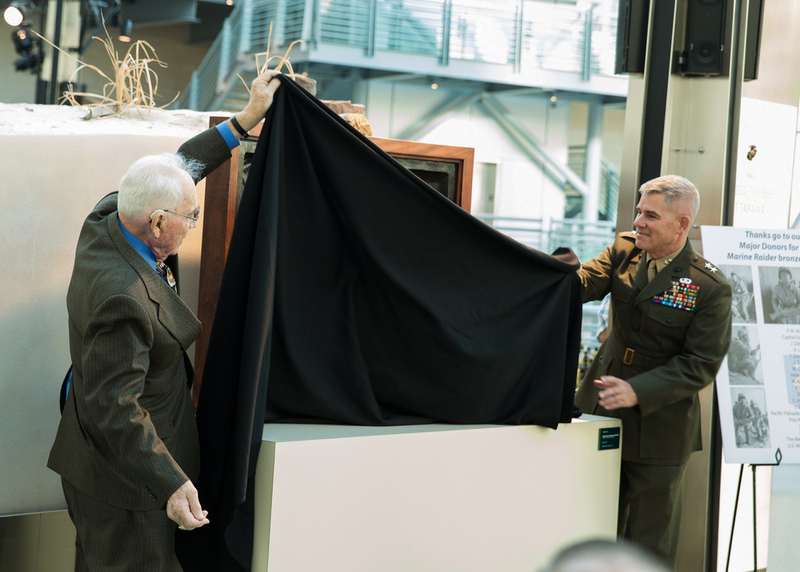 Upon the unveiling of Soul and the Forward and Faithful, Charles Meacham Sr., an original WWII Raider and the man whose vision was realized that day, related several war stories and the camaraderie he experienced as a marine. 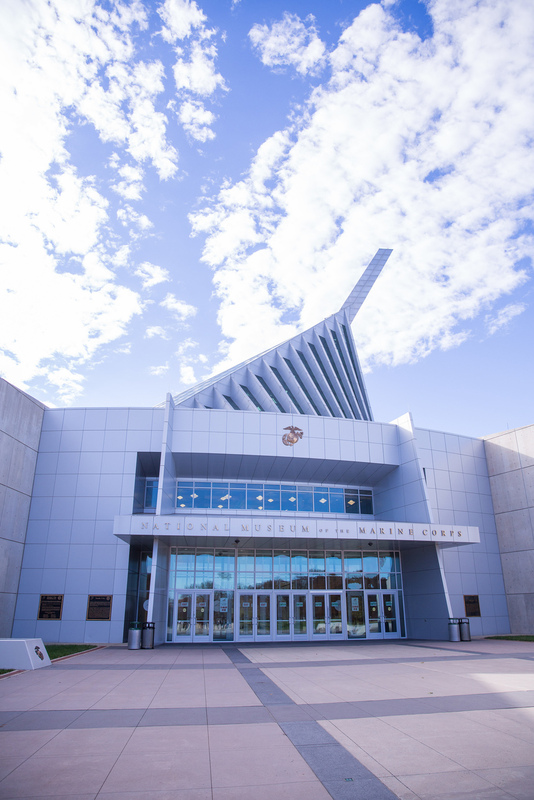 When asked what the sculpture meant to him, he summed it up in the two words that speak volumes about the sculpture’s emotive feeling and the very marines that it honors, “Semper Fidelis” – always faithful.